The Cuckoo ICOOK Q5 Electric Multi Pressure Cooker is the latest in smart kitchen appliances and today I am unboxing one and sharing my initial thoughts with you. Most of you already know I am a HUGE fan of kitchen appliances offering multiple cooking functions and innovative technology. The Cuckoo ICOOK Q5 (5 quart capacity) touts 8 different cooking modes in 1: Soup, Meat, Vegetables, Rice, Porridge, Slow Cook, Browning Fry, and Steam Cook. How awesome is that? One cooker performing a multitude of cooking functions instead of having to use many different appliances. Let’s have a look! I purchased the Cuckoo ICOOK Q5 Electric Multi Pressure Cooker from Amazon. 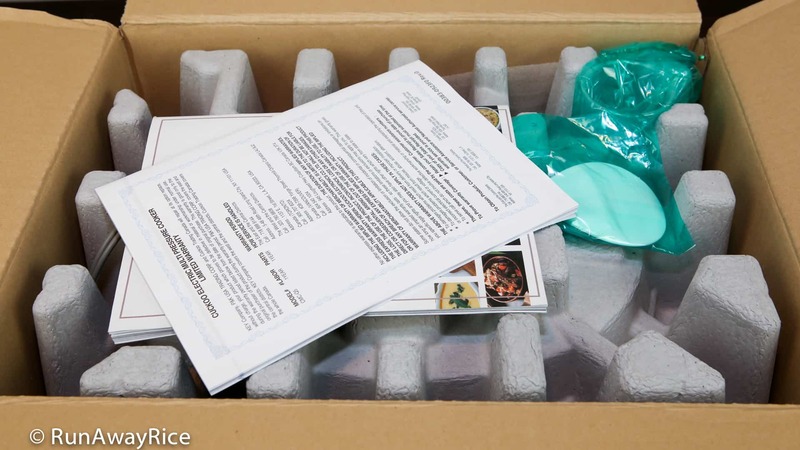 The product arrived well-packaged with the cooker in its original box plus another box from the manufacturer and then packaged in the Amazon shipping box. Below is the product box just waiting for its reveal! Inside the box, right on top are two booklets: the operating instructions and a recipe book. Wrapped in the green plastic bags is a measuring cup and paddle spoon. 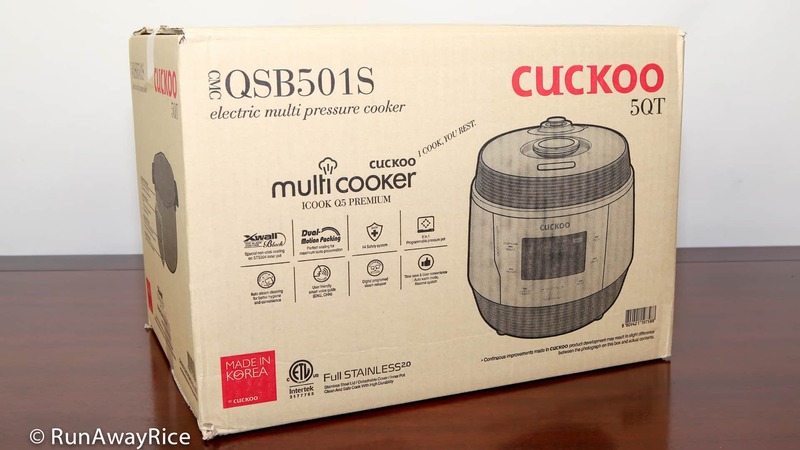 Securely nestled in the box is the Cuckoo ICOOK Q5 Multi Cooker, beautifully shiny and new. The cooker is white with rose gold trim. The color combination is called Gold/White. Auto Steam Cleaning feature is unique and innovative. 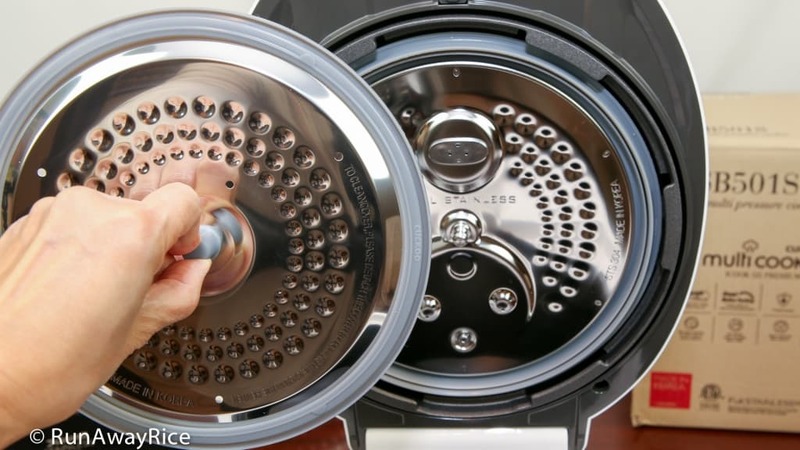 Keeping multi-cookers clean can be a chore sometimes. There’s lots of nooks and crannies for food to hide which makes cleaning a challenge. 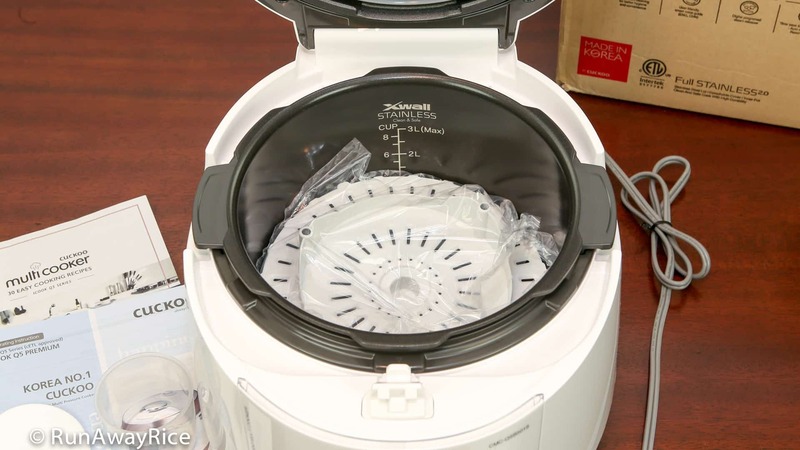 With the Auto Clean feature, a strong jet of steam is released to clean and sanitize the interior of the multi-cooker. After washing the inner pot and wiping down the cooker for the first time, I added 3 cups water into the inner pot, closed the lid and started the Auto Clean feature. This mode takes just 15 minutes. It was an easy way to sanitize the pot before cooking any food and to test and make sure everything was in working order. 3D Heating Technology provides heating from the lid, bottom and side of the pan. The inner pot acts like a heating element which ensures even heat distribution so food is cooked faster and more evenly in any cook mode. 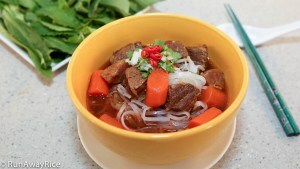 “Soup”, “Meat”, “Vegetables” and “Porridge” are all pressure cook modes. 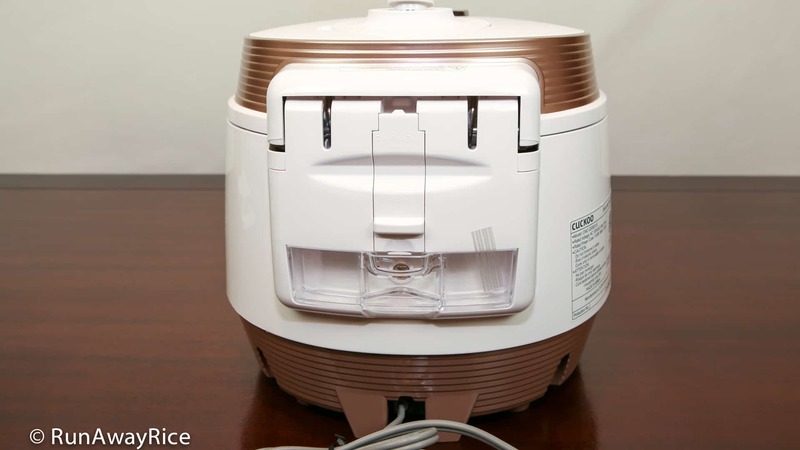 The “Rice” mode uses pressure cook and steam. The “Browning Fry” mode, used for sautéing, has adjustable heat setting, levels 1-6, which is really nice when you need more heat control. With “Multi Cook” and “Steam” modes, you can cook for up to 90 minutes and up to 12 hours for the “Slow Cook” function. These modes also have adjustable heat levels. Cooking with these built-in programs is as easy as selecting the option using the “Menu” button and then pressing the “Cook” button while voice-guided by your Cuckoo culinary assistant. You have the option of delaying cooking for up to 12.5 hours using the Preset function. There’s also a programmable timer which can be set from 1 minute to 12 hours. Once the cooker is done cooking, it automatically switches to the “Keep Warm” mode. To test out my new Cuckoo ICook Q5, I made a batch of jasmine white rice. 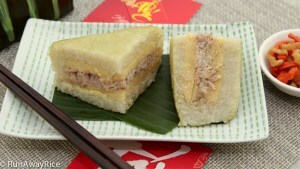 After selecting “RICE” from the Menu and pushing the “COOK” button, the friendly female voice said “Starting the Rice”. Later the chipper voice announced “Steaming is starting”. Steam was then released through the valve in the lid. 4 minutes later, the voice announced “Rice is complete.” followed by the Cuckoo song. The total cooking time was 31 minutes. The Cuckoo ICOOK Q5 is a midsize kitchen appliance with a 5 quart capacity. The dimensions are: 12 inches width by 15 1/2 inches depth by 11 inches height. The height with the lid open is 23 inches. This height would be too tall to fit under the standard 18 inch space between kitchen counter and cabinets. However, during use, the multi-cooker should not be placed under a cabinet but in an open space where the heat and steam can ventilated. The cooker weighs about 16 pounds so it’s weighty. With food, it’ll be even heavier and probably not an appliance you’ll want to pick-up and move around daily. With that said, the best option may be to store it on the counter under the cabinets and then during use, pull it away from the cabinets. The egg-shaped design helps it appear more streamlined and less bulky. It’s definitely an attractive appliance and one you can leave out on the counter. Sadly, the only color option available when I purchased it was Gold/White. I would have really liked the cooker in “Midnight” which I think would go better with my kitchen color scheme. 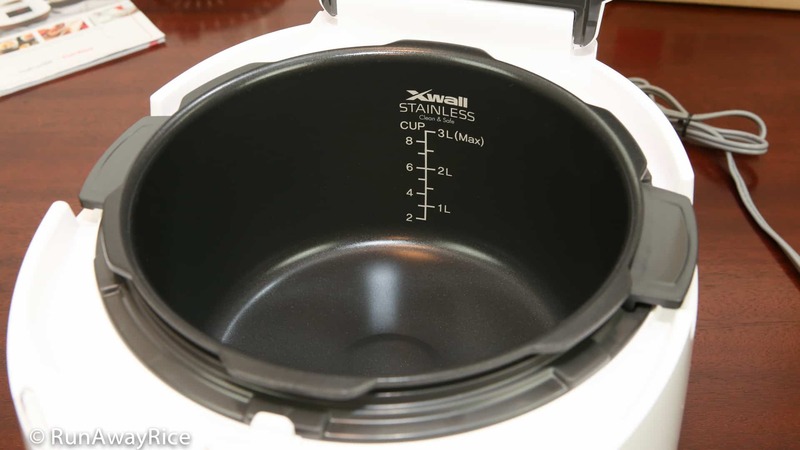 Did you notice the inner pot handles are visible when the lid is closed? The sides of the cooker are notched-out for the handles. This clever design allows you to carry the cooker if needed. The other neat thing about the handles is it’s made of a hard plastic instead of metal so they won’t get super hot during cooking. 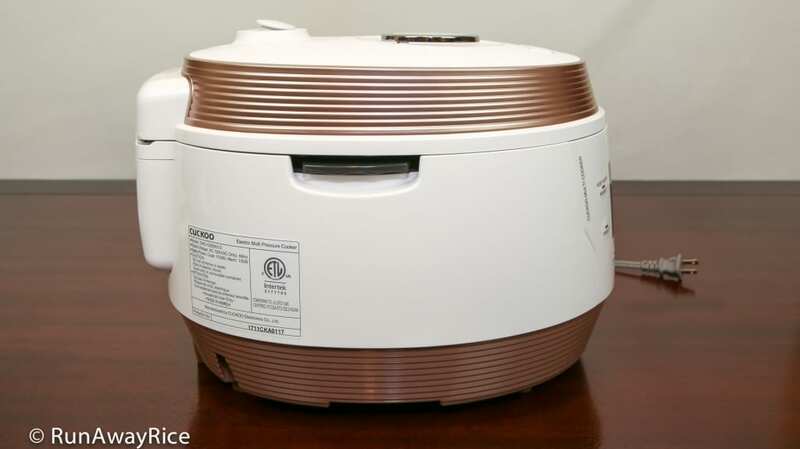 The cooker has a stainless-steel detachable cover which makes it easy to remove and clean. Simply pull on the grey silicone knob to separate the cover from the lid. The technology geek in me loves the Digital-Programmed Steam Release Valve which releases steam automatically when cooking is done or during the Keep Warm mode. I am curious to test this out further with some pressure cooker recipes. “Keep Warm” mode with adjustable temperature is another nifty feature. Many multi-cookers on the market today have a set temperature for “Keep Warm”. Sometimes it works with the foods you make, other times it over-cooks the food and scorches the pot. With the Cuckoo ICOOK Q5, the temperature is adjustable as needed from 154 F – 176 F (68 C – 80 C). The “Keep Warm” function can also be used to reheat food, another versatile option. Of course, I am super excited to try out all the cooking functions with my favorite recipes. 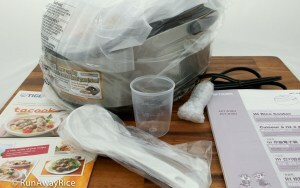 Stay tuned and I’ll share a follow-up post on my Cuckoo ICOOK Q5 multi-cooking adventures. One thing I want to mention is the recipe book included with the cooker contains 30 easy recipes. 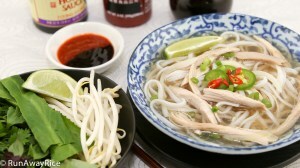 Trying the recipes is a great way to get acquainted with the cooker and enjoy some tasty dishes. Happy Cooking! I can’t find anywhere on the site or instruction manual what the heating level settings mean – if I wanted to slow cook for 6-8 hours, how do I which level for a LOW setting? And what would I use if I wanted to slow cook for 2 hours at HIGH? Level 1 & Level 7 respectively? Unfortunately, the instruction manual doesn’t provide specific temperatures for each Heat Level setting. I have an information sheet which shows Slow Cooking uses Level 1-6 with a temperature range of 212-257 F, so each incremental level would increase the temperature by 9 degrees F. For slow cooking for 6-8 hours, I recommend Level 1 and for 2 hours on High, Level 6. I hope that helps. Let me know if you have more questions. Hi thanks for the review. I bought the q5 cooker last week. Made rice 3 times already. I used the CalTose variety rice and the ratio to water was 1:1. I selected the default 8 mins. Every time the rice came out mushy and soft. Not fluffy. Do I change the default time from 8 to 6 or something? Or even less water? I am very disappointed that it didn’t cook rice right the first time. 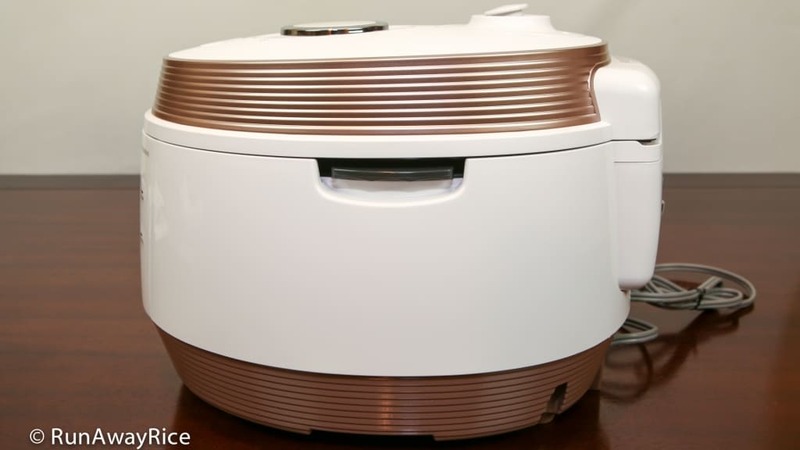 My $25 Oster cooker still cooks great, fluffy rice and I don’t even need to set the time. Thanks for ur time. I am sorry to hear your rice didn’t cook as well as expected. Contrary to what seems obvious, mushy rice is often due to cooking rice too fast and not because of too much water or cooking time. When rice is cooked too quickly, the water is not absorbed into the rice to fluff it up properly but merely coats the grains on the outside, making the overall rice wet and mushy. 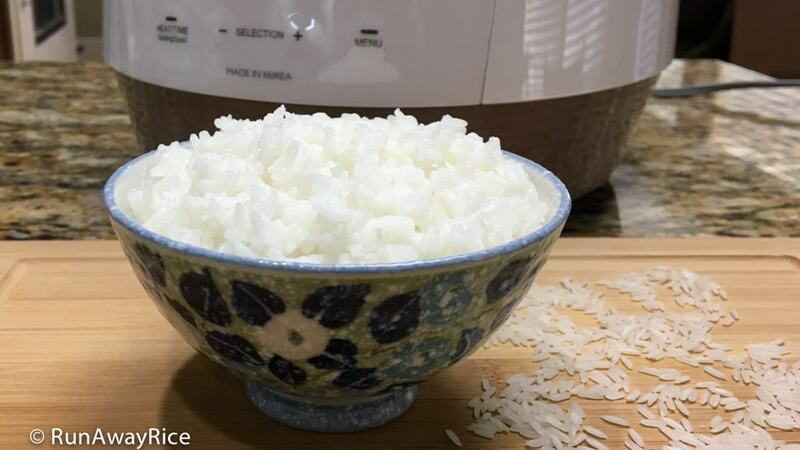 This approach may be different than how you’ve cooked Calrose rice in your Oster rice cooker but give this a try: Let the rice soak in the water (using the same 1:1 water/rice ratio) for 15-20 minutes and then cook. Use the “Rice” setting without any adjustments to the steam time. The soaking should help the rice absorb more water and result in fluffier, better cooked rice. Good Luck and let me know if you get better results. Thank you Trang. How would you cook a whole chicken in the cuckoo……setting? and time? To make a braised whole chicken about 4 pounds, use the “Meat” setting and cook for 30 minutes. (I also use the Browning/Fry function to brown the breast to give it some color before pressure cooking.) Good Luck and let me know how it turns out for you! 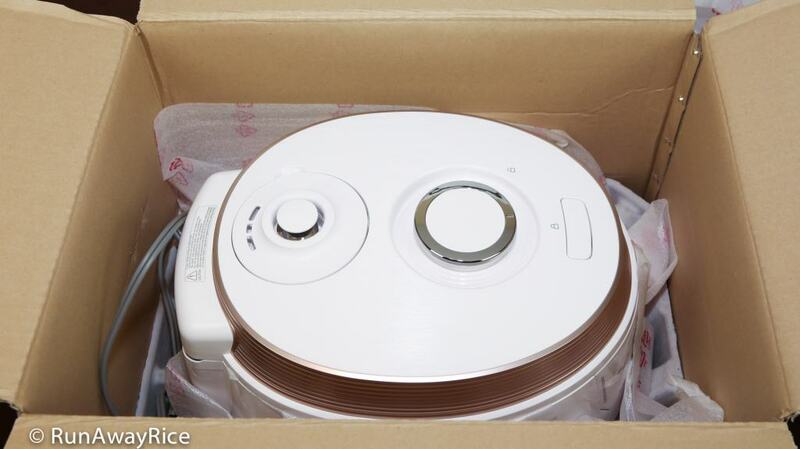 I just received my cuckoo multicooker so far I am happy with my new Multicooker. I cannot find any instructions in the manual on how to increase the hours for the slow cook setting? Also the cuckoo website has several receipes. However the Mac and cheese and ham instructions are for different foods on there website. Any idea where I can access the correct instructions? 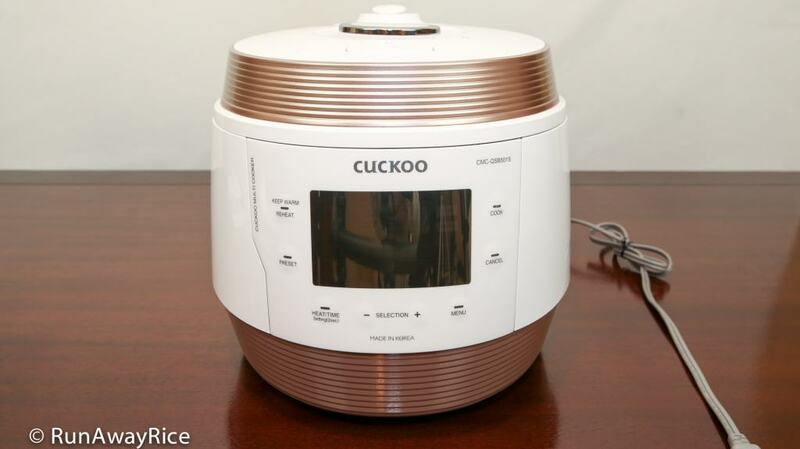 Glad to hear you are enjoying your Cuckoo multi-cooker. After selecting the Slow Cook function, use the SELECTION “+” button to increase the slow cook time. It ranges from 15 minutes to 12 hours. I did a quick search and couldn’t find Mac and Cheese and Ham but there is a Mac and Cheese with bacon recipe https://cuckoomulticooker.com/2018/04/17/macaroni-and-cheese/ Perhaps you can make the substitutions. Enjoy!